"During a career that lasted 45 years, the Italian bass-baritone Sesto Bruscantini acquired an enormous repertory that was notable for the range, musical and dramatic, of the roles that he sang, as well as for their number. He had already won a singing competition at Florence, and in 1945 studied for a year in Rome with Luigi Ricci. To pay for his studies he wrote comments in verse on topical news for a weekly paper. After making his professional debut in 1946 at Civitanova as Colline in LA BOHEME, he spent a year at the Rome Opera School, singing small roles such as the Notary in GIANNI SCHICCHI, and the First Nazarene in SALOME. He also sang in many concerts and began a fruitful relationship with Italian Radio as Sulpice in Donizetti's LA FILLE DU REGIMENT. At Glyndebourne that summer of 1951 he made his debut as Don Alfonso in COSI FAN TUTTE. Singing Fiordiligi was the Yugoslav soprano Sena Jurinac. The following year he moved to Guglielmo in COSI FAN TUTTE and also scored a huge success as Dandini in Rossini's LA CENERENTOLA, both of which were quite definitely baritone roles. After leaving Glyndebourne he went straight to Salzburg, where he sang the title role of Donizetti's DON PASQUALE. Later that year he sang his first Mozart Figaro in LE NOZZE DI FIGARO for Netherlands Opera. Early in 1953 he returned to La Scala for Leporello in DON GIOVANNI and Tadeo in Rossini's L'ITALIANA IN ALGERI. Back at Glyndebourne that summer he repeated his wonderfully comic and elegant Dandini, and returned to Don Alfonso. In June he and Sena Jurinac were married in Lewes, appearing in COSI FAN TUTTE the same evening. They also sang together in the prologue to Strauss' ARIADNE AUF NAXOS, with Jurinac as the Composer and Bruscantini as the Music Master, an unusual excursion into German opera, he sang Papageno in THE MAGIC FLUTE, but only in Italian. His marriage to Jurinac was at first a great success, but later they grew apart and the marriage was dissolved with great difficulty on Bruscantini's side. Nineteen-sixty was a milestone in Bruscantini's career. In February and March he sang the four baritone villains in LES CONTES D'HOFFMANN and Marcello in LA BOHEME at the San Carlo, Naples. Then at Glyndebourne in the summer he took on his first Verdi baritone role, Ford in FALSTAFF. He repeated Ford at Edinburgh and in Turin, then in November he made his US debut in Chicago as Rossini's Figaro. Bruscantini made a very belated Covent Garden debut in 1971 as Rossini's Figaro. He returned to London in 1974 as Malatesta in DON PASQUALE, which was very well received. In 1976 his fine rendering of Simon Boccanegra in the original, 1857 version of Verdi's opera was broadcast by the BBC on New Year's Day, and the following month he sang his first Falstaff with Scottish Opera in Glasgow. Though he made the fat knight a lonely, rather sad old man, he lit the performance with many sly touches of humour. In 1977 Bruscantini made the first of three visits to the Wexford Festival, during which he directed the operas as well as singing in them. 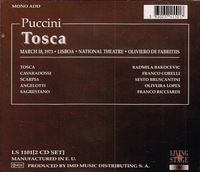 A triple bill of IL MAESTRO DI CAPPELLA, LA SERVA PADRONA and RICCI'S LA SERVA E L'USSERO was followed in 1979 by CRISPINO E LA COMARE by the Ricci brothers, and in 1981 by Verdi's UN GIORNO DI REGNO, in which Bruscantini sang Baron Kelbar, exactly 30 years after singing the role for Radio Italiana. In 1980 the 60-year-old Bruscantini made his debut at the Metropolitan Opera, as Taddeo in L'ITALIANA, followed by Dr Dulcamara in L'ELISIR D'AMORE. He continued to sing throughout the 1980s, appearing at Salzburg three years running as Don Alfonso in COSI FAN TUTTE. At Houston he took on Dr Bartolo in IL BARBIERE. He returned to Glyndebourne in 1985 as Don Magnifico. In 1986 he sang Iago (never one of his best roles) at Dallas in an emergency and obtained a new Rossini role at Bordeaux, Asdrubale in LA PIETRA DEL PARAGONE. In 1988 he sang Don Alfonso in Los Angeles, the four villains in Madrid. In 1989 he sang Michonnet in Rome. In 1990, also in Rome, he sang a new role, the Magistrate in WERTHER, and sang a final Don Alfonso in Macerata. He was 70. After retiring from the opera stage, he started a school of singing in Civitanova."